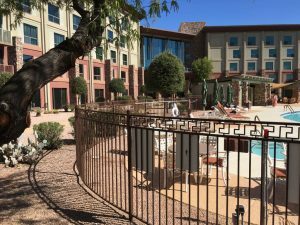 Swimming pools are a widely popular feature for hotels, apartment and condo communities, and other types of commercial properties in the Phoenix area. While pools offer a welcome source of relief from the intense desert heat, they also pose a dangerous dilemma for property owners: how to minimize the risk that children will wander into the pool area without supervision and drown or otherwise become injured. This risk is particularly high at commercial pools, which generally experience a heavy volume of traffic. The pool must be enclosed by a wall, fence, or other barrier that is at least five feet tall. The barrier must have no openings large enough to allow an object four inches or more in diameter to pass. Pool gates must open outward from the pool and have self-closing and self-latching mechanisms located at least 54 inches above the ground. The pool barrier must not have any handholds or footholds on the exterior side that could be used to climb into the pool area. The barrier must be located at least 20 inches from the water’s edge. For commercial property owners, these guidelines are not only required by law—following them is an essential way to reduce liability. When enclosing the pool area, another way for property owners to improve safety is by choosing wrought iron as a material for fences and gates. Wrought iron is naturally more durable than alternative materials like wood or aluminum, making it nearly impossible to bend, break, or otherwise damage. In addition, wrought iron fences tend to be difficult to climb, enabling them to serve as an effective barrier to anyone who attempts to enter the pool area without permission. Due to wrought iron’s strength, it tends to remain in good condition for many years—making wrought iron pool barriers a sound investment for property owners. While improving safety by installing proper pool barriers, commercial property owners must also ensure that their pool areas are aesthetically appealing and accentuate the style of the surrounding property. Another advantage of wrought iron is its elegant appearance and ability to be customized to suit a wide variety of styles, ranging from sleek and simple to ornate and decorative. At DCS Pool Barriers, we have over a decade of experience designing, manufacturing, and installing pool fences and gates for various commercial properties throughout the greater Phoenix area. Our team is familiar with all state and local regulations governing pool barriers, and we carefully ensure that each project is up to code, installed properly, and complementary to the property’s style. To receive a free estimate on new or updated pool barriers for your commercial property, call us today at 623-825-7700 or contact us online!